Are you passionate about fashion and makeover? Want to be the best fashion makeover stylist and create your own styles? Wonderful Wedding Makeover! will help you to do just that. Follow the latest fashion trends, clothing outfits and makeovers that will leave you coming back for more. You’ll get the opportunity to fully express your creativity and your sense of style in fashion makeovers with Wonderful Wedding Makeover! 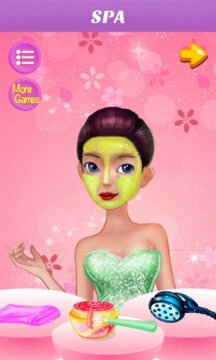 In this fantastic makeover game, you are going to meet princess and give her a makeover. We have created a beautiful and pleasant makeup room for princess. In that room, you will find all the items that are needed for giving a fantastic makeover. All her facial care products are created only using fruits, flowers and herbs because Barbie loves to use the facial products made using natural ingredients. The natural skin care products that we have created will definitely make her face shiny. The makeup items, outfits and accessories we have here are carefully created by our makeup artist, fashion designers and many other fashion experts. Are you ready to give your friend, princess a cool makeover?